Homer ran into a friend yesterday. Their family gets a variety of foodstuffs from us, and they have a desire for something additional. There are regional food delicacies everywhere. Berger cookies, Goetz's Caramel Cremes and crab cakes made with a bit of Old Bay spice and a tiny bit of egg come to mind. There are cheeses, fermented foods, grass fed milk. Oysters on the half shell, fish peppers. Chipped chopped ham. Biscuits with gravy. Chorizo. Matzo. Oh my, so many and Homer and I are happy to try. Regional conditions change flavors, tastes, textures. 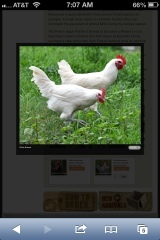 So the request for Bresse chicken is of interest to us. A chicken developed in that region of France, popular enough to support growing a million chickens a year and selling for about $11 per pound (equivalent). A good sized bird would be about $50. An usexed, day old chick is $50. It has to be grown out, fed, watered, under the heat lamp and protected from all of the predators that love chicken. If we get 4, at a cost of $200, there is no guarantee that there would be a mix of males and females, to be able to breed our own. The whole issue with roosters is that they usually make a lot of noise. And they attack me. Not exactly a winning combination. The birds themselves are white with bright red combs and blue feet. They are known for their deep flavor, lovely fat and marbled meat. The feet are always included, left attached, with each bird. We are not set up now to bring these birds onto our farm and will monitor the availability of this interesting variety. We know the difference in flavor of what we grow here from other places, and have tasted different varieties of chickens, so we are curious but not set up for these birds. yum.